Ray Kelley, BS’04, served his country for nine years as a Marine and an Army reservist but, today, he serves the interests of his former comrades on Capitol Hill. Kelley is the national legislative director for AMVETS in Lanham, Md., the fourth largest Veterans Service Organization. Today, the 40-year-old is busy urging lawmakers to fix what he calls a broken system for managing veterans’ medical claims. Kelley said AMVETS is also actively pushing for better access to medical services and higher education. “Forty percent of all veterans live in a rural or remote area,” Kelley explained. “That means they are several hours away from a VA medical clinic. Making sure they get the quality medical care they deserve is also an issue. Kelley understands the statistic better than anyone. In 1995, Kelley enrolled in classes at IU East after serving as a military police officer in the U.S. Marine Corps from 1989 to 1995. He enlisted as soon as he graduated from Hagerstown High School. But he left IU East after one semester. 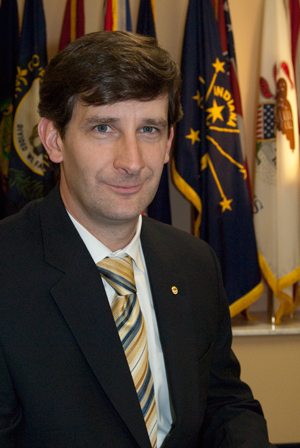 Kelley eventually returned to IU East for a second try through the support of his wife, Rebecca, and after meeting Paul Kriese, an associate professor of political science. Kelley said Kriese gave him the confidence to return and succeed in school. Conversely, Kriese says Kelley challenged him to be a better professor. Their relationship continued after Kelley graduated with a Bachelor of Science in Behavioral Sciences with a concentration in political science. Kelley still enrolled in graduate-level classes at Ball State University and, eventually, Kelley returned to the U.S. Army Reserve as a psychological operations team leader. He conducted over 250 combat missions independently and in conjunction with indigenous forces and Special Forces in the North Babel Province of Iraq. “I was a busy boy,” he said. “There were days when I would run two missions. I would be out on a mission talking to some local leaders and just trying to be nice; drinking tea with them and sitting on their couch to get to know them a little bit. Then, we would be hit with an IED (improvised explosive device).” But he eventually took his former professor’s advice, and it served him well. His alma mater is proud of him, too. IU East recognized Kelley with its 2010 Distinguished Alumni Award at the campus’ May commencement, an award shared by former local politicians and business leaders, among graduates with other pedigrees.